From family pictures to your favorite beach vacation memories, you can upload any photo from your phone or laptop and create a unique Father’s Day photo card that makes Dad smile. Furthermore, we offer three styles. Select from glossy photo paper, double sided, and folding photo cards and choose a layout to showcase Dad’s favorite memories. You can even use our text feature to include a personal message that custom printed for a professional look. With all of our available custom options, you can forego the trip to the local drug store. Stop searching and start creating. 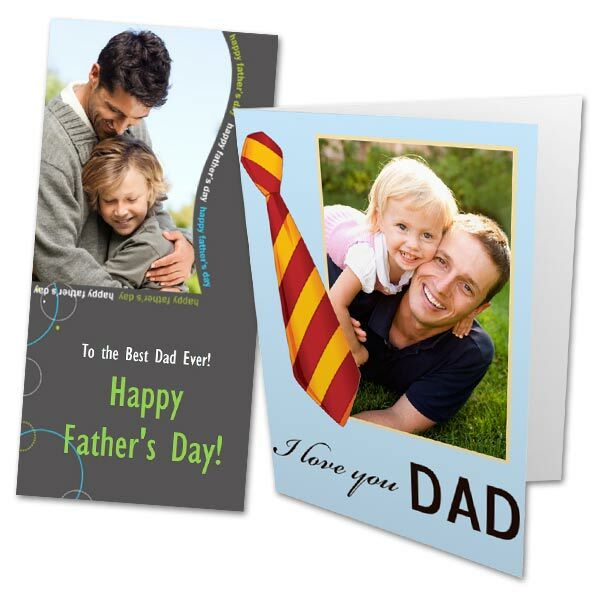 With a little creativity, you can make the perfect Father’s Day greeting card that makes Dad’s day picture-perfect! Looking for cheap Father’s Day gifts? Give Dad a Father’s Day Photo Book or make a personalized apron that he can use all summer at each family BBQ. Just like our photo cards, you can upload pictures and create unique, special gifts that come from the heart!